Your old Shield nickel value starts at $18 each. This minimum value is assigned to a common date, heavily worn coin. Discover an 1879 or 1880 in your group and the value climbs rapidly to $232 to $1,161 or more. Here is something that might be helping your coins value. It is quite possible the condition of your nickels are better than the low value "Good" grade, further enhancing their value. Find any well preserved Shield Nickel and it becomes more desirable to dealers and collectors. For you it is now a $23 coin. For example, the "Uncirculated" Shield nickel pictured to the right is worth at least $115. In this condition it becomes a highly collectible coin. Aside from rare dates, the condition of a coin is everything. It determines the desirability and your Shield nickel value. The following Shield Nickel Value chart shows most have a wholesale value between $18 and $115. If your coin is a rare date and close to a higher grade and higher value, you have the option of an independent grading service evaluate your coin. This is covered in more detail below. Variations in value do occur subject to subtle grading points, collector demands and dealer needs. 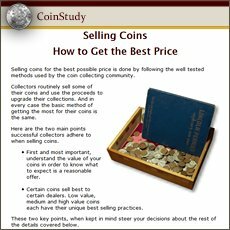 For more background information, see how value listings in the above Coin Value Guide are determined. You stand a better chance of finding a higher condition Shield Nickel than a rare date. The combined mintage of the three rarest dates 1879, 1880 and 1881 is 110,700 coins. Not many have survived until today and rarely found. Find greater value in your coins by accurately determining their "Grade". 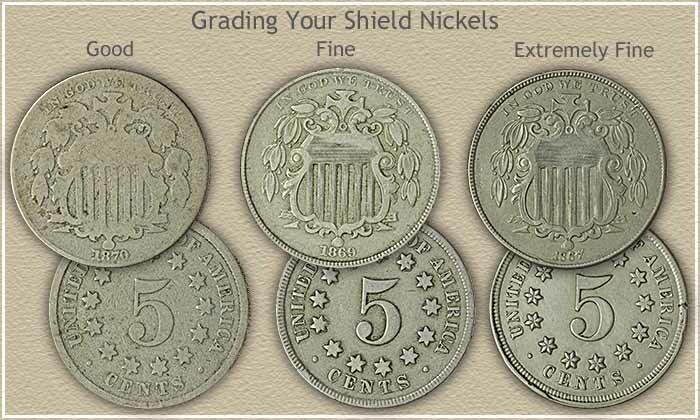 Compare your nickels to the grading images below and assign each a grade. Hopefully your coins are in the more collectable "Fine" to "Extremely Fine" or better condition. The sharpness in detail of the leaves surrounding the shield is one of the items to observe. On the reverse, the stars are the first to show wear. As these designs become more distinct, the condition and your old nickel values improve. To help determine the worth of your coins, check a few rare coin dealers' listings, look for those offering Shield Nickels for sale. Their listings and prices usually include a notation of the NGC or PCGS assigned grade. Additionally... these coin dealers are potential buyers of your coins. 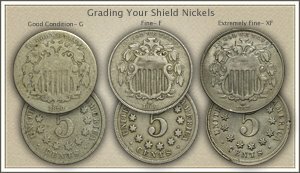 In-depth how to grade Shield nickels. Video along with images and descriptions identify key factors to the condition and assigning a grade. Shield Nickels rise and fall in favor with collectors. However, their values generally rise and hold, waiting for the next wave of excitement. Return here whenever curious and stay current with your Shield nickel value. The index page for Liberty, Buffalo, Jefferson and Three Cent Nickels. Discover your coin values by matching your coins to the grading images and look them up on the value charts. Coin Values Discovery... find Shield Nickel Value and... All old US coin values. It is an excellent index with images and text links to all coin series, from Cents to Gold. Value charts, grading images and descriptions uncover how much your box of old coins is worth. Today's modern nickel design changes are attracting attention to all Nickel coin series. More interest, creates more collectors and the result is higher values. Shield, Liberty and Buffalo Nickels should all benefit. Old nickel values are headed higher. Consider your coins as the beginnings of a collection. One successful approach is to sell all your coins and use the proceeds to purchase one nice rare coin... the one you where hoping to find in the box. Pass the thrill of a rare and valuable coin on to your children.